For you, from us. The best of Hvar. 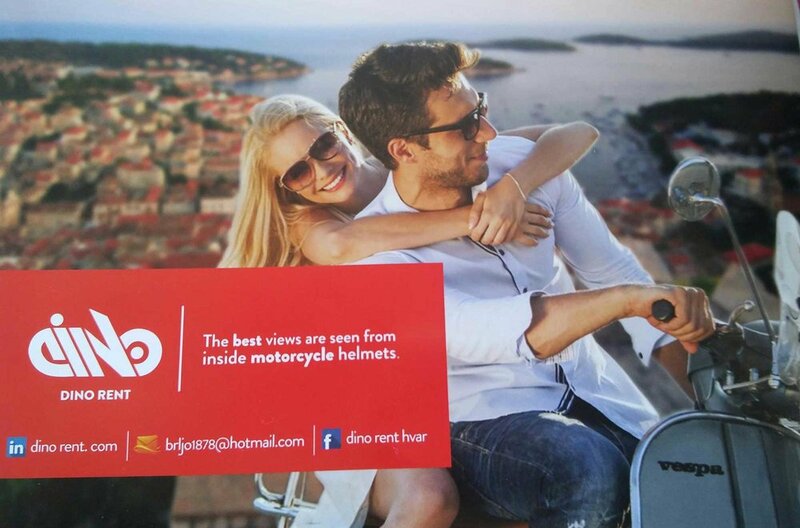 Founded in 2010 on the island of Hvar, Croatia (Dalmatia), Dino Rent provides scooters, cars, boats, speed boats and more on an hourly, daily or even weekly basis. With their helpful staff, quality products and affordable prices, they hope to make your vacation even better! Whether it's a group excursion to the Blue Cave, a private tour or boat rental (with or without a skipper), Hvar Boats has you covered. Visit their website below to tailor an experience to perfectly fit your vacation! Situated in Jelsa (a small coastal town on the outskirts of Hvar), Tomić Winery produces between 130,000 and 150,000 bottles a year, cultivating from numerous autochthonous grape varieties and striving to produce the best quality wines possible. Also buried in stone below the winery is their tasting venue - modelled on the ancient Roman dining room called a 'triclinium'. Carved of stone, ceilings of tufa and pillars of travertine, for those wishing to escape the world for a while and experience some of Hvar's rich history, this is a must. Fig is also proud to serve a selection of hand-picked Tomić wines. For those who want to discover the amazing underwater world on one of the most beautiful islands in the World (Hvar), Viking Diving has what you need. They offer a wide range of scuba services, a diving school associated with PADI, SSI, and also IAHD (diving for disabled), introductory dives, dive excursions and rental gear.